Getting a university education is a crucial stepping stone on your path to starting a career, and it's the best time in your life to begin building your network and developing your employable skills. Learn alongside professionals in your field and make important contacts through UBC’s work programs, work-study programs, research opportunities, and co-op terms. Working part-time while you study is a great way to earn extra cash, meet new people, and get professional experience. UBC’s Work Study program on the Okanagan campus is an employment program that helps fund well-paid, on-campus jobs. The program has five components to aid your growth: personal and professional development; developing workplace skills; exploring potential career paths; experiential learning that complements your academics; and ongoing support and mentorship. Work Learn is an employment program offered on the Vancouver campus that helps you develop professional skills and earn a paycheque while you complete your studies. Meet new friends, connect with businesses in your community, and offset the cost of your tuition. The program gives you the chance to apply your knowledge in practical settings, and promises to provide mentorship opportunities, help expand your network, give you ownership and responsibility over your work, and contribute to your personal learning goals. 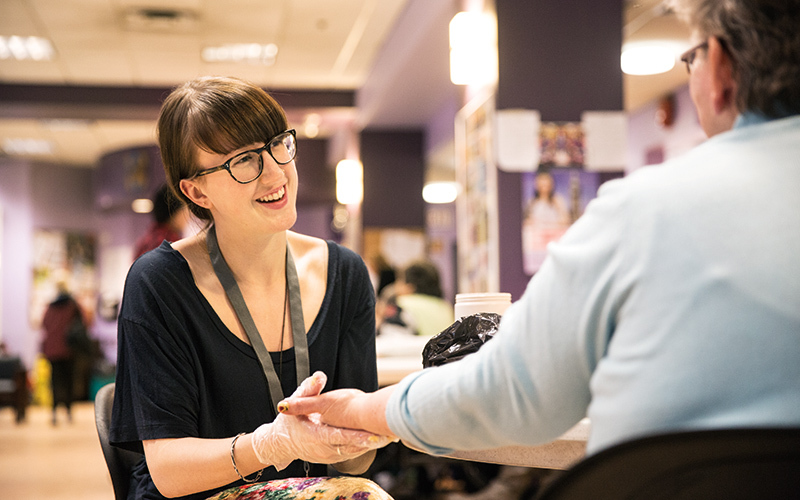 UBC’s Co-operative Education Program is the largest of its kind in BC, with dedicated co-op support staff on both the Okanagan and Vancouver campuses to help you every step of the way. With co-op, you can combine your studies with full-time, paid work experience in a variety of fields. Bachelor of Management and Faculty of Applied Science students on the Okanagan campus can join UBC Okanagan’s Co-op Program. Through co-op programs on the Vancouver campus, you can pursue co-op placements in Arts, Business, Engineering, Forestry, Kinesiology, Land and Food Systems, and Science. Want to get involved with important research projects on UBC’s Okanagan campus or Vancouver campus? You don’t have to wait until you graduate – UBC offers you many different opportunities to pursue innovative and original research as part of your undergraduate learning experience. Each campus offers different resources, opportunities, clubs, and awards designed to promote undergraduate research. If you’re looking for research experience in an academic setting, you should consider applying for an Undergraduate Student Research Award for the chance to work on one of your UBC professors’ research projects. From the Sauder School of Business on the Vancouver campus to the Irving K. Barber School of Arts and Sciences on the Okanagan campus, your options are abundant. The annual Undergraduate Research Conference on the Okanagan campus showcases research projects of Honours and Directed Studies undergraduate students in the Irving K. Barber School of Arts and Sciences. Bring your research projects here. If you’re interested in research, but not sure where to start, join the Undergraduate Research Opportunities club on the Vancouver campus to connect with high-calibre research opportunities and meet ambitious students like yourself. Through this club, you can get involved with the Research Experience Program, a multidisciplinary mentorship program that facilitates your entrance into research by pairing you with a research mentor. If you’ve completed or are planning on participating in a faculty-supervised research project, the Multidisciplinary Undergraduate Research Conference is your place to showcase your hard work to friends, family, and fellow UBC students. All the resources you need to help plan your finances and discover the cost of your education.